Logistics stakeholders in Asia have shrugged off the China-US trade war as a “bump in the road” and reiterated their commitment to free trade. 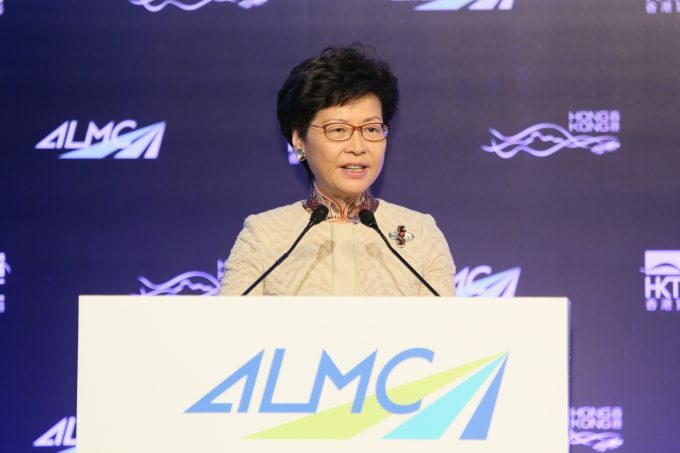 “As we all know, free trade is taking somewhat of a thrashing these days, given the rise of unilateralism and protectionism,” Hong Kong chief executive Carrie Lam (pictured) told delegates at the Asia Logistics & Maritime Conference yesterday. Addressing delegates at the event in Hong Kong, Ms Lam noted that the special administrative region had just completed a free trade agreement (FTA) with Australia, while a similar deal with ASEAN will begin in January. “ASEAN is our second-largest trading partner and the agreement will surely boost our trade, investment and overall connectivity,” she said. Karen Reddington, Asia Pacific president for FedEx Express, said the agreement, and the recently announced upgrade of the China-Singapore FTA, signalled a regional pursuit of physical, digital and regulatory connectivity. Ms Reddington played down the impact on global trade of the US tariffs on Chinese goods. “It’s worth putting it into perspective, because when we look at these things we look at the long run, and we just have to navigate our way through this bump in the road. “Yes, it’s the two biggest economies in the world, but from a FedEx perspective, but this lane only represents around 2% of our revenue. “The tariffs are a tax, they’re a cost, but they aren’t a full stop. Trade will continue, we will be there to adapt,” she said. Earlier this year, FedEx announced a new route connecting Hanoi with its Guangzhou hub and Ms Reddington singled out Vietnam as experiencing particularly strong trade growth, adding that intra-Asia trade, led by the “old Asian tigers”, was showing tremendous growth. Maersk Line’s head of Greater China, Mike Fang, said global trade was “flexible and resilient”, with customers looking at sourcing alternatives in India and Vietnam. “South-east Asian countries are growing fast, but China’s growth is still robust – GDP growth is still 6%, which is a big opportunity for all,” said Mr Fang. However, Parash Jain, head of transport research Asia Pacific at HSBC, warned that 2019 was “looking dangerous” for shipping lines, since there was “no sign of restocking to reflect the rush orders from tariffs”. He explained: “What surprises me most is, while anecdotally many of the shipping lines and retailers are talking about front-loading of demand to beat tariffs, it has not been reflected in the retail inventory-to-sales ratio.